Vegetarian appetizers like this bean dip are wonderful, even if you are having a meat based meal. It takes a while to soak the beans, but that doesn’t take any of your time. Simply put them in water and soak them overnight. They are ready to use the next day. I think you will like the mix of flavors. Cover the beans with water and let soak overnight. The next day, drain and rinse. OR a quicker method is to boil the beans for 1 or 2 minutes, then let them sit for 1 hour. Then drain and rinse. In a large saucepan, combine the beans, onion, ginger, 1/2 teaspoon of the salt and enough water to cover it all. Bring the mixture to a boil. Reduce the heat and simmer, uncovered, until the beans are tender, About 35 to 40 minutes. Drain well. In a food processor, puree the beans with the oil, vinegar, hot pepper sauce and remaining salt and pepper. Chill before serving. 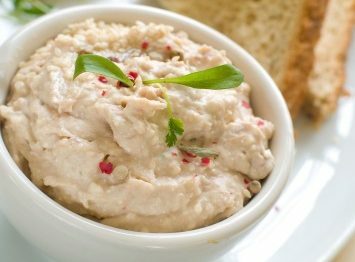 This bean spread is great on crackers wedges of pita bread. You can also spread it on vegetables like celery and carrots or try it as a substitute for butter on pita bread or in sandwiches. You can make this bean spread with canned beans, but cooking all the flavors together while you cook the beans, really gives this spread a great taste. Obviously to can add as much of your favorite hot sauce, or as little, as you want. This recipe is very healthy as it is. It is a higher carb dip because of the beans, but every ingredient in it is healthy. The only suggestion I would have to make it even healthier is to cut down a little bit on the oil. Also, use as high a quality olive oil in this dip recipe as you can, preferably an extra virgin olive oil (EVOO). The better the quality of the oil, the healthier it is. Beans are a healthy protein, although they do contain a fair amount of carbohydrates so they aren’t great for low carb dieters. For the rest of us though, they are great. Beans have a lot of fiber which is great for our digestive system. They are also high in iron. Beans are a fantastic meat replacement in our diets. This recipe is sometimes called Fazool. Fazool is Italian for beans, as in pasta fazool. Find more appetizer recipes like this fantastic bean dip here.